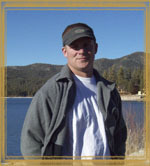 Welcome to Loose Painting, serving your home painting needs in the Big Bear Lake area for over 15 years. 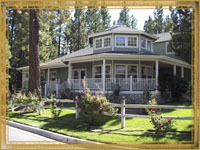 We specialize in painting mountain homes in the Big Bear Lake area. Painting homes in mountain environments requires special preparation, high quality paints, and knowlege of how mountain conditions affect paints and finishes. Our experience is key in providing our customers with the highest quality product at competitive rates. 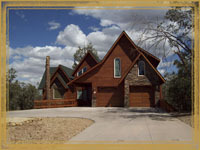 Log home coatings - Log homes need special attention in order to retain protection, beauty and value. With Loose Painting, your home will be finished professionally and be added to our maintenance program for yearly upkeep. Preparation before finishes are applied - Preparation is 99% of the job. Lack of prep work is a waste of the customers time and money. With Loose Painting all preparation will be done to the fullest extent. This will ensure that the finish coats will have the maximal life span. Finish Coats - A minimum of two finish coats are applied, sometimes three depending on the situation. We do not recommend using flat finishes for mountain environments. All of our product are rolled into all surfaces. 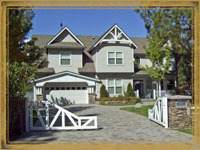 Custom Painting - Custom painting includes both Interior and Exterior surfaces. Please call us with your request. Stains and Lacquers - We specialize in fine finishes for cabinets, doors, banisters, mantles, and any other fine wood that requires a professional finish. We only use the finest products - Paints include Dunn Edwards and Fuller O'Brien. Stains include Cabot, Wood Pride and Super Deck Products. Other services offered include deck refinishing and repairs. Please look around, and thanks for visiting. Please don't hestiate to give us a call with any questions.